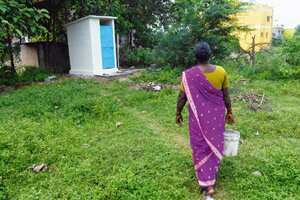 A woman using the toilet constructed by Hyundai in Irungattukottai village. The women of Irungattukottai—a village on the outskirts of Chennai—like those in thousands of villages around the country, have been forced to develop strong bladders and sphincters (and frank talk about bodily functions doesn’t faze them, either). For reasons of modesty, S. Samundeeswari and other female residents of the village habitually wait until darkness falls before using open-air sanitation facilities—basically, behind the bushes; this is really the only option available for a majority of the villagers. In the next four years, the company will carry out similar plans in seven other villages in the area, at a budget of about Rs1 crore per village for sanitation and other village improvement activities, though the figure remains flexible based on need. “We want Hyundai to be seen as part of the community here," says R. Sethuraman, Hyundai India’s senior vice-president, finance and corporate affairs, and a trustee of the Hyundai Motor India Foundation (HMIF), which oversees the company’s corporate social responsibility (CSR) activities. When Hyundai India was charting out its CSR plan for the village last year, it had a non-governmental organization—FSL India—study the village and ask residents what they needed most. Beating company executives’ ideas such as establishing kitchen gardens in government schools and renovating roads, the overwhelming request was for proper toilets. Hyundai’s toilets, which follow a design recommended by the Tamil Nadu District Rural Development Agency, are no more than about 7ft-tall boxes with a small concrete platform outside for baths. Users must carry in buckets of water, and the toilets are not connected to a sewerage system, relying instead on individual “leach pits" that collect solid waste and let out liquid waste through a perforated cement lining. This design offers the advantage that the compost, which may be removed once in 10 years, can be directly reused as fertilizer without further treatment, according to K. Sridar, Hyundai’s CSR manager. Hyundai India’s goal of bringing about sustainable change in the local communities had helped craft its CSR strategy of starting small and scaling up slowly, according to the company’s managing director and chief executive officer, Han Woo Park. “Every project helped us strengthen the bond between the organization and the community, and it helped us assess their real needs, which in turn helped us choose projects appropriately," Park says. “We have learnt to focus only on those projects which combine sustainability with an impact on a fairly large number of people."